Access to onboard connectivity is increasingly becoming a deciding factor in whether young and talented individuals want to spend their lives at sea, and whether shipping companies are able to retain experienced and high qualified seafarers, said an expert. France-based IEC Telecom, one of the leading global providers of managed network communication solutions along with Inmarsat - a pioneer of mobile satellite communications, hosted the session. The ‘Navigating Connectivity While at Sea’ session brought together renowned industry experts including Brandy; managing director at IEC Telecom Middle East Nabil Ben Soussia; marine superintendent for Mercan Group Gürkan Büyüktelli; and Rashid Isa Rishi Al Heddi, group managing director of Seamaster Maritime. The session was presented in four panels, where experts shared their evidence-based perspectives on the critical role connectivity plays in enhancing ship efficiency, safety and environmental standards, the direct link between connectivity at sea and crew wellness and the benefits of unlimited internet access for ship management, it said. Drew Brandy opened the session presenting outcomes of a new Royal Holloway University of London study commissioned by Inmarsat and the Sailors’ Society that draws on the availability of communications tools and its impact on crew behaviour, self-esteem, wellbeing and even productivity. With over 90 per cent of worldwide trade served by the maritime market, vessels at sea rely on broadband connectivity and VSAT technology to stay in touch with operations on land, increase work productivity and improve the quality of life for seafarers that are the backbone of the maritime industry, it added. Nabil Ben Soussia, managing director at IEC Telecom Middle East emphasised the need for companies to implement the right balance between meeting corporate goals and maintaining crew welfare for operational efficiency and cost-effectiveness. He added that with no fundamental technology or financial barriers to connectivity at sea, and with innovations in technology propelling a networked economy on land, it is becoming easier to ensure connectivity at sea. Yet, businesses are quite reluctant to provide open access to crews on account of fear of increased and high running costs, large file downloads and overall work disruption. 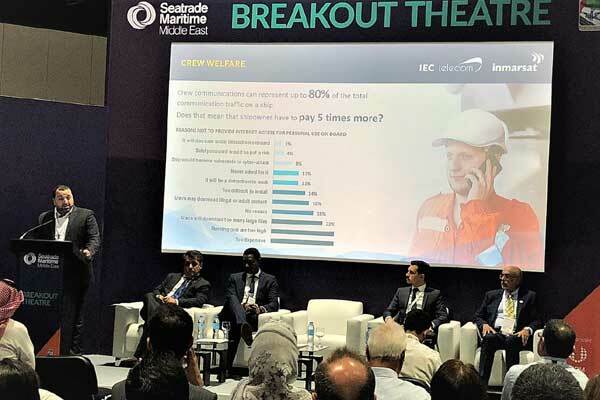 Ben Soussia explained that the OneGate Maritime is a unique platform developed by IEC Telecom that meets the dual requirements of onboard connectivity for crew welfare as well as for corporate use. It provides 360 support for corporate communication, helping businesses manage bandwidth, monitor usage consumption, control budget and retrieve 24/7 satellite support. At the same time, the OneGate Maritime improves the crew wellbeing on board by providing access to a high-quality voice and data connection including VoIP, web browsing, VOD and emails. It allows tight control over budgets while managing crew allocations. It also includes the ability to hold remote crew training, arrange special assistance via telemedicine and more. Captain Büyüktelli, marine superintendent, Mercan Group – Chemical Tanker Operator presented the benefits of unlimited internet access to ship management with insights from end-users on different challenges and opportunities. With thousands of merchant ships crossing the oceans and millions of cargo containers in tow, Capt. Büyüktelli explained the need for fast and efficient communications aboard vessels and between land and sea. “Connectivity is about more than just web-browsing or access to social media; it’s about providing support for problem-solving, remote diagnostics or telemedicine as well as opportunities for continuous learning,” he said. “Connectivity can benefit such areas as container movements, crew welfare, ship management and operation, cross-industry collaboration, land and shore communication. Ultimately businesses will see a reduction in costs, increase in productivity as well as improved overall industry cooperation,” he said. The panel was moderated by Captain Zarir Irani, global president of the IIMS and a veteran mariner with more than 27 years of work experience in the Maritime and Oil & Gas industry who contributed greatly to the discussion on maritime connectivity.